IDSync® reduces the complexity, improves the precision and reduces the efforts, and the costs associated with the initial provisioning for new employees and the on-going costs and effort required to maintain and support accurate application, password and personal information across hybrid local/cloud application scenarios for existing users. The goal of IDSync® is to solve the problem of user identity management and respond to the cost saving opportunity by delivering on the promise of Active Directory so that it can truly become a single source of identity information for both Cloud and On-premise applications. With the IDSync® Identity Platform we’re minimizing the administrative time and effort for our customers making it easier for them to work with both the Ingram Automation ecosystems. 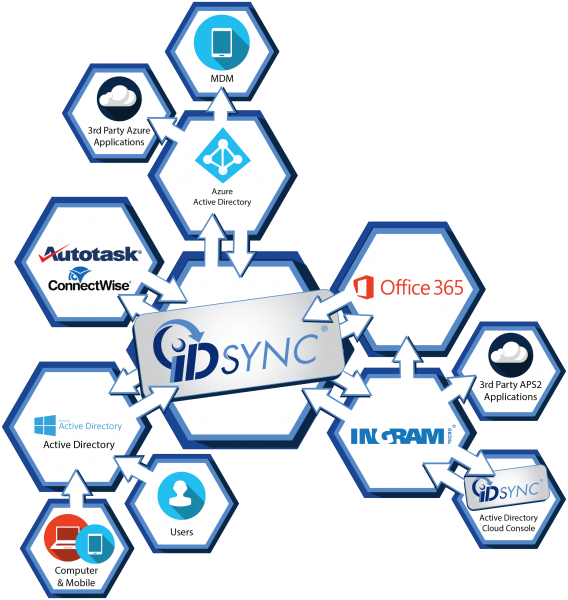 IDSync® is an identity management platform tightly integrated to Microsoft Active Directory that provides application level control of features and permissions in addition to user provisioning, security, password synchronization, and access control. IDSync® provides a completely meshed identity in Cloud applications (Office 365, Azure, etc. ), On-premise AD, and many other applications within the standard Active Directory interface, or within our web-based Cloud Portal. IDSync® unifies the purchase, provisioning, and management Ingram Cloud Marketplace clients between on-premise Active Directory, the Ingram Cloud Portal, and other MSP and CSP management applications like Connectwise and Autotask. IDSync® Active Directory integration enables rapid deployment and simplified management but then goes beyond just the basic AD Connect tools allowing for a variety of deployment scenarios that are commonly encountered by Service Providers and Hosting Companies. These include complex hybrid, or even multi-tenant Active Directory synchronization. The IDSync® Service Provider edition is specifically focused on Hosting Service Providers, Cloud Service Providers, and MSP companies while providing the same cost reduction and management benefits to the end-user as our Enterprise edition. IDSync® reduces the complexity of Cloud application deployment for end-users by extending the standard Active Directory property pages to enable centralized management for a user’s credentials, meta-data, and application configuration information from within the tool that many companies already utilize – Microsoft Active Directory while allowing the Service Provider to manage those same users from within the Cloud Portal without having to worry about VPN, Security Settings, or Access Control. IDSync® is integrated with many other cloud portals and SaaS applications including Ingram Micro Cloud Marketplace, Odin Automation, and many 3rd party applications integrated with the APS 2 standard. Manage enablement, disablement, password changes and even application features and settings for a user with a single point of control using standard directory Security Groups to provision multiple users simultaneously. IDSync® updates all connected applications in real-time and seamlessly integrates the standard Active Directory features with cloud applications and Service Provider systems alike and extends these applications to provide support for Groups, Contacts, Distribution Lists and much more. Single place for customers to administer Ingram Users, Active Directory without portal(s) logins. No need for end-user to manage in multiple portals.